Finding the perfect bunk bed is a tricky business – I know, I’ve been there and done that. I only wish that when we’d been looking for our bunk bed this gem from House Of Orange was around! Last year we mentioned House Of Orange’s awesome Lily table and bench set and now they have stunning bunk beds joining the ranks. Each bunk bed is made to order from eco-friendly pine timber and customised to suit any space. If colour is an issue, you’re spoilt with six to choose from – dutch blonde, limewash grey, charcoal, stonewash, domino black and high gloss white opal, all of which will complement existing bedroom decor. House Of Orange bunk beds are gorgeous in design – a fuss free, minimalist style to see a child through their single bed years. I absolutely adore the cool industrial hue of the limewash grey (pictured above) – a great unisex colour that’s smashing with all sorts of coloured bed linen! 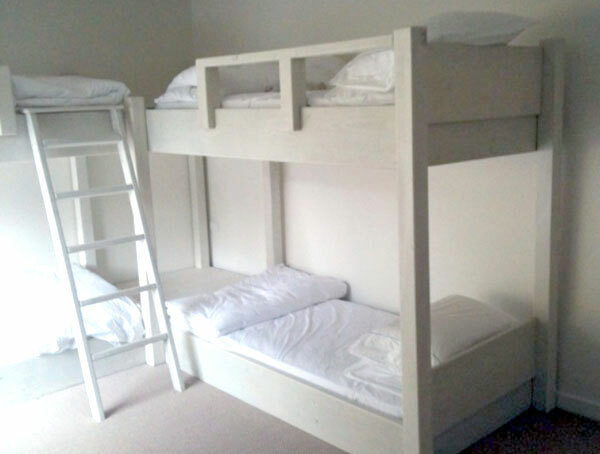 The basic single sized, two bed bunk with ladder in your choice of colour will cost $1895. A handy trundle bed that slides in underneath will set you back another $395 and is well worth the investment for when little (or big) visitors sleep over. Contact House Of Orange to order.